Cordyceps is one of the most highly prized herbs due to its rarity as well as its numerous health benefits. In traditional Chinese medicine (TCM), it has been used to fortify the lungs and kidneys, supplement one's vital essence and support the immune system. Its sweet property also makes it a nourishing tonic. However, the appropriate use of this herb depends on a person's constitution and the environment. TCM practitioners frequently describe cordyceps as a harmonious tonic for both the yin and yang elements, though the herb has a slightly warm nature. A balance of yin (the element responsible for cooling organs) and yang (the element linked to heat) in the body is needed for good health. Just as important is a good flow of qi, or vital energy. The cordyceps herb is believed to be particularly useful for certain groups of patients. Cancer patients, for instance, can use it to boost their immunity before they undergo mainstream cancer treatment, said Ms He Qiuling, a senior physician at Eu Yan Sang TCM Clinic in Chinatown. Following surgery, chemotherapy or radiotherapy, such patients may experience side effects such as dry mouth, dry skin and fatigue. Cordyceps can address these signs of qi and yin deficiencies and strengthen the body's resistance to aid recovery, she added. Ms Jie Jun Dong, a TCM physician with more than 20 years of experience, said the herb is effective for treating tuberculosis, though it is a rare disease these days. The herb is now more commonly used to treat chronic asthma, chronic bronchitis and heart disease resulting from a lung disorder (pulmonary heart disease). These are conditions which give rise to shortness of breath, a symptom of qi deficiency. 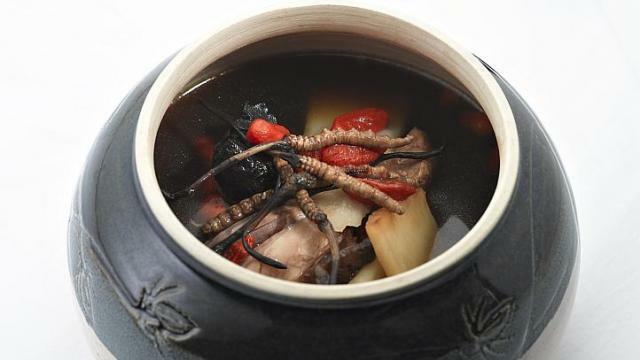 Ms Jie said she usually prescribes cordyceps for patients with kidney failure, as they often suffer from a lack of qi, yin and yang in their kidneys. She said diabetics are also prone to having kidney problems, which is why they encounter more frequent urination and, as the disease progresses, fluid retention. They, too, would benefit from using cordyceps. In TCM, the proper distribution of water in the body depends on the health of the kidneys. The cordyceps herb can also help those who sweat excessively when they sleep at night, she said. Ms He said the dosage of wild cordyceps used in prescriptions is around 10g. If people choose to consume the herb on their own, they should take no more than 5g a day if they are adults, and no more than 2.5g for children under 12. Dr Philip Eng, a senior consultant respiratory physician at Mount Elizabeth Hospital, said there is a lack of data about using cordyceps to treat asthma and tuberculosis. He feels that patients should not take the herb alongside Western medicine as their interactions are "unknown and untested". Wash and clean the chicken. Remove the skin as it can be too oily. Rinse the Chinese yam, fragrant Solomon's seal rhizome and dried longans before soaking them till they are soft. Rinse the cordyceps and Chinese wolfberries. Place the chicken, soaked herbs and cordyceps in a double-boiler. Fill the outer pot with boiling water till it is about three quarters full. Simmer over low heat for three or four hours. Add the rinsed Chinese wolfberries into the soup and simmer for another 30 minutes. Sprinkle salt into the soup. Dish out and serve.